^ Kelly, M., Caso, A. & Lopez Gonzalez, C. 2008. Lynx rufus. In: IUCN 2010. IUCN Red List of Threatened Species. Version 2010.1. ^ a b Zielinski, William J; Kuceradate, Thomas E (1998). American Marten, Fisher, Lynx, and Wolverine: Survey Methods for Their Detection. DIANE Publishing. pp. 77–8. ISBN 0788136283. ^ Johnson, W.E., Eizirik, E., Pecon-Slattery, J., Murphy, W.J., Antunes, A., Teeling, E. & O'Brien, S.J. (2006). “The Late Miocene radiation of modern Felidae: A genetic assessment.”. Science 311: 73–77. doi:10.1126/science.1122277. PMID 16400146. ^ Mills, L. Scott (November 2006). Conservation of Wildlife Populations: Demography, Genetics, and Management. Blackwell Publishing. p. 48. ISBN 1405121467. ^ Wilson, Don E; Ruff, Sue (September 1999). The Smithsonian Book of North American Mammals. Smithsonian Institution Press. pp. 234?5. ISBN 1-56098-845-2. ^ Wozencraft, W.C. (2005). "Order Carnivora". In Wilson, D.E. ; Reeder, D.M. Mammal Species of the World: A Taxonomic and Geographic Reference (3rd ed.). Johns Hopkins University Press. p. 542. ISBN 978-0-8018-8221-0. OCLC 62265494. ^ Cahalane, Victor H (2005-03-01). Meeting the Mammals. Kessinger Publishing. p. 64. ISBN 141799522X. ^ Ulmer, Jr., Fred A. (1941). “Melanism in the Felidae, with Special Reference to the Genus Lynx”. Journal of Mammalogy 22 (3): 285–288. doi:10.2307/1374954. http://links.jstor.org/sici?sici=0022-2372%28194108%2922%3A3%3C285%3AMITFWS%3E2.0.CO%3B2-T.
^ Sparano, Vin T (September 1998). Complete Outdoors Encyclopedia. St. Martin's Press. p. 228. ISBN 0312191901. ^ a b c McDowell, Robert L (April 2003). Endangered and Threatened Wildlife of New Jersey. Rutgers University Press. pp. 23–4, 27. ISBN 0813532094. ^ a b c Fergus, Charles (2003-08-01). Wildlife of Virginia and Maryland Washington D.C.. Stackpole Books. p. 119. ISBN 0811728218. ^ a b c d Nowell, K. and Jackson, P. (1996). Wild Cats. Status Survey and Conservation Action Plan. (PDF). IUCN/SSC Cat Specialist Group. IUCN, Gland, Switzerland. ^ Sikes, Robert S.; Michael L. Kennedy (1992). “Morphologic Variation of the Bobcat (Felis rufus) in the Eastern United States and Its Association with Selected Environmental Variables”. American Midland Naturalist 128 (2): 313–324. doi:10.2307/2426465. http://links.jstor.org/sici?sici=0003-0031(199210)128%3A2%3C313%3AMVOTB(%3E2.0.CO%3B2-E.
^ a b c d e f Whitaker, John O; Hamilton, W J (1998-01-01). Mammals of the Eastern United States. Cornell University Press. pp. 493–6. ISBN 0801434750. ^ Kamler, JF; Gipson, PS (Jul-September 2000). “Home Range, Habitat Selection, and Survival of Bobcats, Lynx rufus, in a Prairie Ecosystem in Kansas”. Canadian Field-Naturalist 114 (3): 388–94. オリジナルの2008年12月6日時点によるアーカイブ。. https://web.archive.org/web/20081206130858/http://md1.csa.com/partners/viewrecord.php?requester=gs&collection=ENV&recid=4848238&q=Lynx+rufus&uid=1023712&setcookie=yes 2007年5月26日閲覧。. ^ a b Janečka, JE; TL Blankenship; DH Hirth; ME Tewes; CW Kilpatrick; LI Grassman Jr. (August 2006). “Kinship and social structure of Bobcats (Lynx rufus) inferred from microsatellite and radio-telemetry data”. Journal of Zoology 269 (4): 494–501. doi:10.1111/j.1469-7998.2006.00099.x. http://www.blackwell-synergy.com/doi/abs/10.1111/j.1469-7998.2006.00099.x 2007年6月18日閲覧。. ^ Lovallo, Matthew J.; Anderson, Eric M. (April 1996). “Bobcat (Lynx rufus) Home Range Size and Habitat Use in Northwest Wisconsin”. American Midland Naturalist 135 (2): 247–8. doi:10.2307/2426706. ^ Nielsen, Clayton K.; Alan Woolf (July 2001). “Spatial Organization of Bobcats (Lynx rufus) in Southern Illinois”. The American Midland Naturalist 146 (1): 43–52. doi:[[doi:10.1674%2F0003-0031%282001%29146%5B0043%3ASOOBLR%5D2.0.CO%3B2|10.1674/0003-0031(2001)146[0043:SOOBLR]2.0.CO;2]]. ^ Chamberlain, Michael I.; Bruce D. Leopold, L. Mike Conner (2003). “Space use, movements and habitat selection of adult Bobcats (Lynx rufus) in Central Mississippi”. The American Midland Naturalist 149 (2): 395–405. doi:[[doi:10.1674%2F0003-0031%282003%29149%5B0395%3ASUMAHS%5D2.0.CO%3B2|10.1674/0003-0031(2003)149[0395:SUMAHS]2.0.CO;2]]. http://cat.inist.fr/?aModele=afficheN&cpsidt=14678518 2007年5月27日閲覧。. ^ a b c d Feldhamer, George A; Thompson, Bruce C; Chapman, Joseph A (2004-01-01). 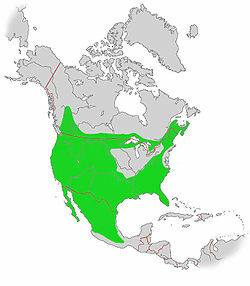 Wild Mammals of North America. Johns Hopkins University Press. pp. 769–70. ISBN 0801874165. ^ Baker, Leslie A.; Robert J. Warrena; Duane R. Diefenbacha; William E. James; Michael J. Conroy (January 2001). “Prey Selection by Reintroduced Bobcats (Lynx rufus) on Cumberland Island, Georgia”. The American Midland Naturalist 145 (1): 80–93. doi:[[doi:10.1674%2F0003-0031%282001%29145%5B0080%3APSBRBL%5D2.0.CO%3B2|10.1674/0003-0031(2001)145[0080:PSBRBL]2.0.CO;2]]. http://www.bioone.org/perlserv/?request=get-abstract&doi=10.1674%2F0003-0031(2001)145%5B0080%3APSBRBL%5D2.0.CO%3B2 2008年11月7日閲覧。. 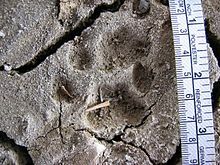 ^ “A Comparison of Bobcat and Coyote Predation on Lambs in North-Coastal California”. The Journal of Wildlife Management 62 (2). (April 1998). http://links.jstor.org/sici?sici=0022-541X%28199804%2962%3A2%3C700%3AACOBAC%3E2.0.CO%3B2-B&size=LARGE&origin=JSTOR-enlargePage 2008年1月7日閲覧. "The proportion of Bobcat scats containing sheep consumed by Bobcats was small (4.2%) and occurrence did not peak in the lambing season, suggesting that sheep consumed by Bobcats were scavenged." ^ Labisky, Ronald F.; Margaret C. Boulay (April 1998). “Behaviors of Bobcats Preying on White-tailed Deer in the Everglades”. The American Midland Naturalist 139 (2): 275–281. doi:[[doi:10.1674%2F0003-0031%281998%29139%5B0275%3ABOBPOW%5D2.0.CO%3B2|10.1674/0003-0031(1998)139[0275:BOBPOW]2.0.CO;2]]. ^ Major, JT; JA Sherburne (1987). “Interspecific relationships of Coyotes, Bobcats, and Red Foxes in western Maine”. Journal of Wildlife Management 51 (3): 606–616. doi:10.2307/3801278. http://md1.csa.com/partners/viewrecord.php?requester=gs&collection=ENV&recid=1651611 2007年6月28日閲覧。. ^ a b c Fischer, William C.; Miller, Melanie; Johnston, Cameron M.; Smith, Jane K. (1996-02-01). Fire Effects Information System. DIANE Publishing. p. 83. ISBN 0788145681. ^ a b Nowak, Ronald M (April 1999). Walker's Mammals of the World. Johns Hopkins University Press. p. 809. ISBN 0801857899. ^ Peterson, Roger Tory; Murie, Olaus Johan (1998-01-15). A Field Guide to Animal Tracks. Houghton Mifflin Field Guides. p. 115. ISBN 0395910943. ^ Brown, Tom (1986). Tom Brown's Field Guide to Nature Observation and Tracking. Berkley Trade. ISBN 9780425099667. ^ Fuller, Todd K.; Stephen L. Berendzen, Thomas A. Decker, James E. Cardoza (October 1995). “Survival and Cause-Specific Mortality Rates of Adult Bobcats (Lynx rufus)”. American Midland Naturalist 134 (2): 404. doi:10.2307/2426311. http://links.jstor.org/sici?sici=0003-0031(199510)134%3A2%3C404%3ASACMRO%3E2.0.CO%3B2-C 2007年5月26日閲覧。. ^ Kikuchi, Yoko; Chomel, Bruno B; Kasten, Rickie W; Martenson, Janice S; Swift, Pamela K; O’Brien, Stephen J (February 2004). 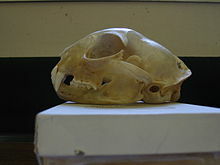 “Seroprevalence of Toxoplasma gondii in American free-ranging or captive pumas (Felis concolor) and Bobcats (Lynx rufus)”. Veterinary Parasitology 120 (1–2): 1–9. doi:10.1016/j.vetpar.2004.01.002.